Journey To Bethlehem is a FREE event for the entire family. It is a live, outdoor telling of the Christmas story complete with the sights and sounds of the first century. You’ll be immersed in the story and celebrate the birth of Jesus as you encounter shepherds, angels, Roman soldiers, and Magi on your way to Bethlehem. Finish the night with complimentary hot cocoa and cookies! Invite your family and friends to join you and enjoy. After all, This IS Christmas! Journey to Bethlehem will be on Friday, Saturday and Sunday December 7-9, 2018, from 6-9pm each night. As you arrive on campus, you will notice many other families who have come to experience our 25th Anniversary of Journey to Bethlehem. You’ll join us in our Worship Center as we sing traditional Christmas carols before you begin your journey. When it is time for your “family” (typically 30 people) to exit the Worship Center, you will be directed to Nazareth, your first stop on your way to Bethlehem. In Nazareth, you’ll meet your Guides, and then head outdoors to travel together to Bethlehem along the mulched trails through the woods. Each journey lasts about 40 minutes. You will encounter many characters along the way to meeting the Messiah, but beware of the Roman Soldiers! At the end of your Journey to Bethlehem, you will be invited inside to warm up and be treated to hot chocolate and cookies. **Please wear appropriate shoes and clothing. A majority of the journey is outside on a mulched, wooded trail. 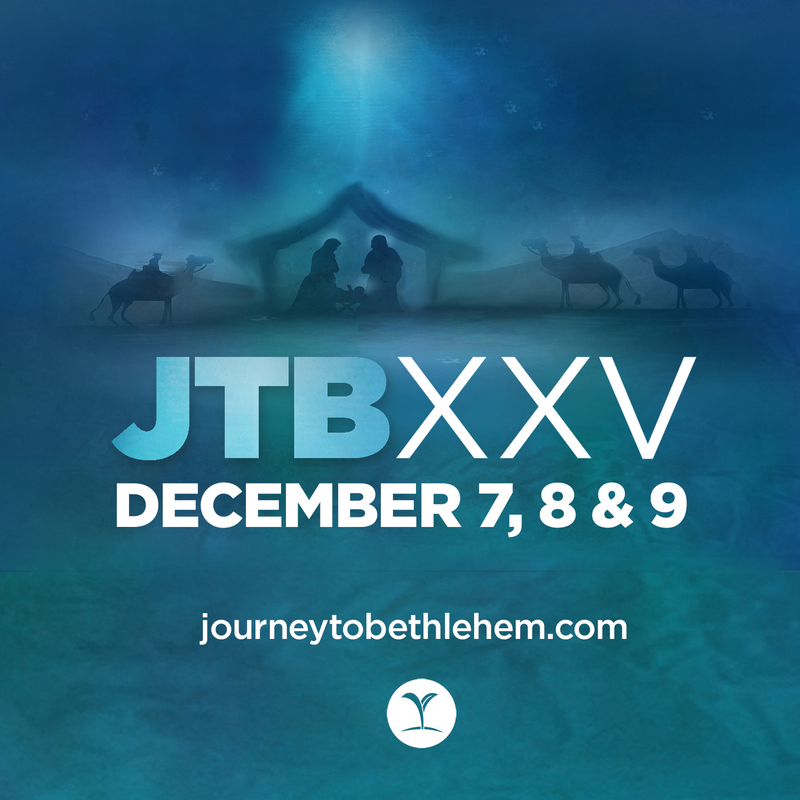 Invite others to join you at Journey to Bethlehem! Here is an image you can share on your social media!